Human language is not the same as human speech. We use gestures and signs to communicate alongside, or instead of, speaking. Yet gestures and speech are processed in the same areas of the human brain, and the study of how both have evolved is central to research on the origins of human communication. Written by one of the pioneers of the field, this is the first book to explain how speech and gesture evolved together into a system that all humans possess. Nearly all theorizing about the origins of language either ignores gesture, views it as an add-on or supposes that language began in gesture and was later replaced by speech. 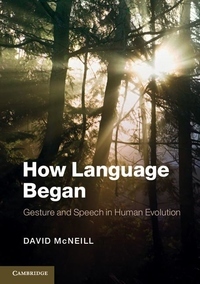 David McNeill challenges the popular 'gesture-first' theory that language first emerged in a gesture-only form and proposes a groundbreaking theory of the evolution of language which explains how speech and gesture became unified.